When and from where do the tours depart ? The tours depart every day from Our office. Our office is located at 2-6-7 Higashishinbashi, which is near from the Shimbashi Station on the JR Lines, Tokyo Metro Ginza Line and Toei Subway Asakusa line. Please refer to the map here. The meeting time is 10minutes before the departure time. It is highly advisable. You should try to make a reservation as early as possible. However, if there is space on a tour, we will always try to accommodate late riders. Can I leave my luggage at your office ? Yes, You can leave your luggage, suit case, backpack…etc at our office. 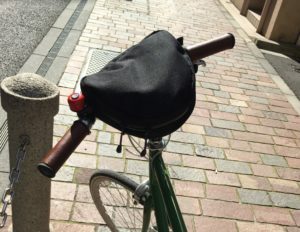 Should I bring small backpack for cycling ? It’s not necessary. Our bikes have small bag and bottle holder. Will I fully enjoy the tour even if I don’t speak any Japanese ? The entire guided tour is conducted completely in English. So even first-time visitors to Japan can enjoy and relax the day with colorful descriptions of all the sights in English! I’m alone can I join the tour ? In case of rain, do you cancel the tour ? We will not cancel the tour due to a rain. We are preparing raingears and can lend you for free. But we may cancel the tour because of really bad weather such as Typhoon and snow. When we cancel, We will send you an email or call your contact number or the hotel you are staying. How is the weather in winter in Tokyo? Lowest is 2C (35F), Highest is 15C (59F). Better to have Jacket, Knit, Long Pants/ Denim, Warm Socks, Gloves, Neck Warmer, etc. Reservation can be made 120days prior to the tour date. How do I make a reservation and how far in advance must I reserve a tour ? You can make a reservation directly from this site, or if you need information right away, please call us at +81-(0)3-6809-2293 between 9:00am and 6:00pm. You can also join any tour at the last minute if seats are still available. Please call us or email us beforehand and we can give you the most current information. When do I pay for the tour ? When a booking request is made within 4days to the tour date, You can pay on the day of the tour. Please pay at our Office on the day of the tour. We accept both credit cards and cash. When a booking is made 3+ prior to the tour date, you will be required the full payment for the tour fee in advance. In that case, we will send you the invoice and please pay by credit cards. Can I pay the tour fee by Credit cards ? What is your cancellation policy like ? Please see our Cancel policy for the cancellation policies for our various tours. Can I join with Child ? 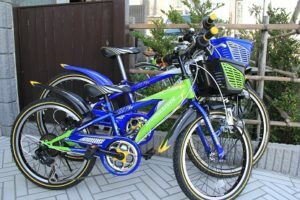 Yes, We can provide bicycle for kids from 120cm (3’9″). The kids should be able to ride a bike without any problem and should be used to it on streets. We are going through car streets and side walks, sometimes we need to pass by cars. 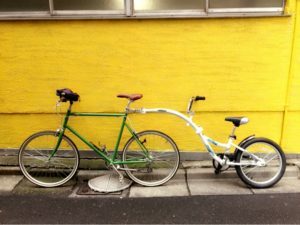 I want to join with my kids but they can’t ride on bicycle. We have Tag Along Bikes. I have not been getting enough excercise lately. 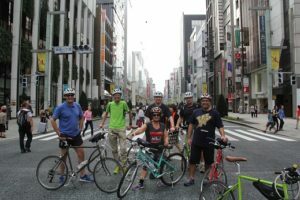 Our bike tour is not serious bike ride, more sightseeing ride. We will stop several places, learn about history, take a rest, picture time, toilet, etc. But an average physical level and a general ability of biking would be needed. 8 speed cross bike. Frame size 47cm – 57 cm suitable for minimum height of 150 cm (5 ft.) or taller. Do you have a rental bike service? Sorry we don’t have a rental bike service due to safety problems.